Interstate 70 EB & WB between SR 315 and I-71 will close this weekend beginning Friday night, September 14 to install steel beams for the new Grant Ave. bridge. 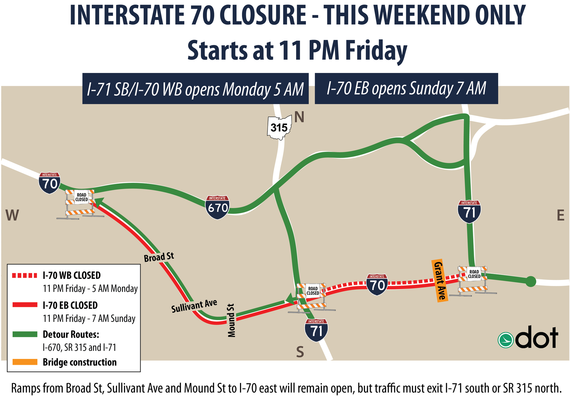 Eastbound I-70 will reopen Sunday morning, while I-70 westbound will remain closed until 5 AM Monday. A map illustrating the weekend closure is below. The new Grant St. Bridge is expected to open by Dec. 31 of this year, weather permitting. This is one in a series of ODOT projects to improve the I-70/71 corridor through downtown Columbus. Detour: I-71 NB to I-670 WB to SR 315 SB to I-71 SB. I-70 WB will be reduced to one lane between Ohio Ave. and 18th St.
Detour: I-71 NB to SR 315 NB to I-670 EB to I-71 SB to I-70 EB. For traffic to continue on I-71 NB, take SR 315 NB to I-670 EB to I-71 NB. Detour: I-71 SB to I-670 WB to SR 315 SB to I-70 WB. For traffic to continue on I-71 SB, take I-670 WB to SR 315 SB to I-71 SB.